Bring your bathroom an elegant and dashing look with DreamLine's D12972-09 Hinged Shower Door. It is a 35" x 72" hinged door coming from the Unidoor-X collection. This collection has been responsible for immensely elevating the shower experience. It is hailed by consumers for its durability, and high-quality finished look. This swing shower door, graced with clean lines and updated accents, add ageless style to any bathroom. It has an ambidextrous design and is reversible for a right or left door opening. Completely frameless, its design gives you an illusion of extra space when you are in the shower. The satin black hardware finish is equally sophisticated, sensual, and romantic. Aside from its aesthetic value, it enhances the hardwares durability and makes it easy to clean. This DreamLine Shower Door utilizes luxurious, clear, chic-looking glass panels that will match any bathroom theme and will leave zero distraction from any bathroom decor. These are ANSI-certified tempered glasses - they are proven durable and practically unbreakable. 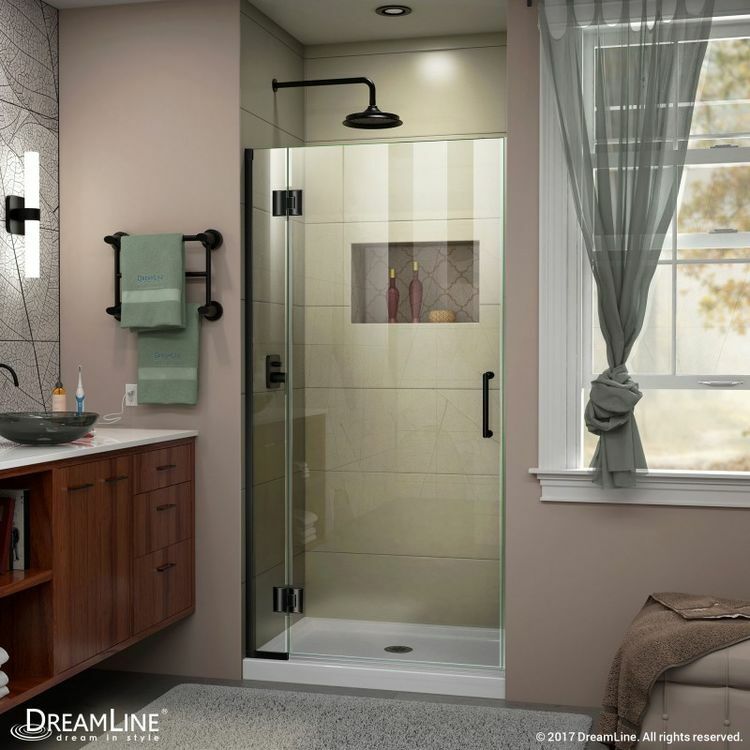 This DreamLine Unidoor-X Shower Door has a door walk-in that measures 28" and a hinged panel that is 6" wide.The solid brass hinges are self-closing, enhancing ease of use and convenience. It is backed by DreamLines 1-year manufacturer warranty a warranty that you never have to use! DreamLine has been a world leader on affordable luxury bathroom solutions with exceptional ratings on customer satisfaction and product excellence. Shipping Dimensions 80.0" x 43.0" x 14.0"
Shipping Dimensional Weight 273.07 lbs.